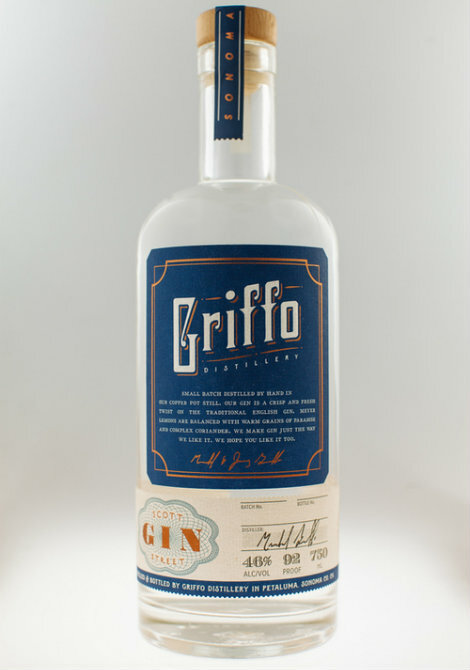 Griffo Distillery’s Scott Street Gin won a gold medal in the SF World Spirits Competition. 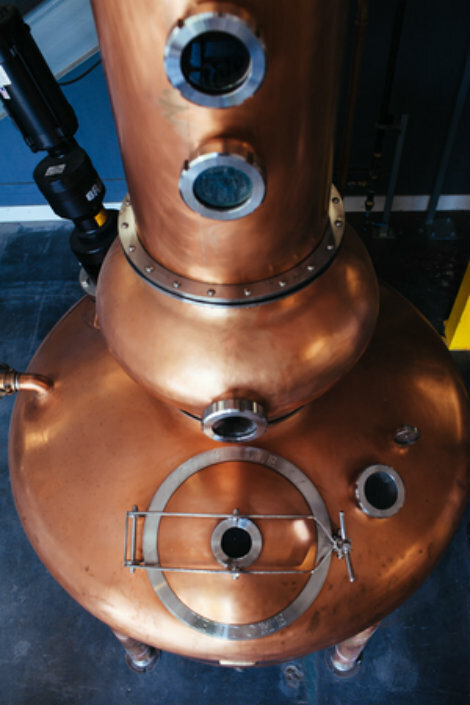 Griffo spririts are made in this custom-made, 250-gallon copper still. All photos by Michael Woolsey for Griffo Distillery. 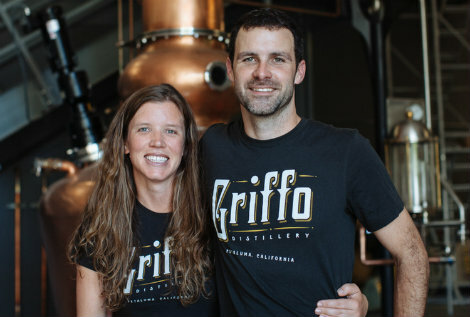 Griffo Distillery is a family-owned distillery that creates small-batch, grain-to-glass spirits including gin, bourbon, and rye whiskey. Co-founders Mike and Jenny Griffo conceived the idea of starting a family distillery one relaxing afternoon in Wine Country. It took seven years of penny pinching, recipe testing, and heavy lifting (both mental and physical) to turn that dream into a reality. 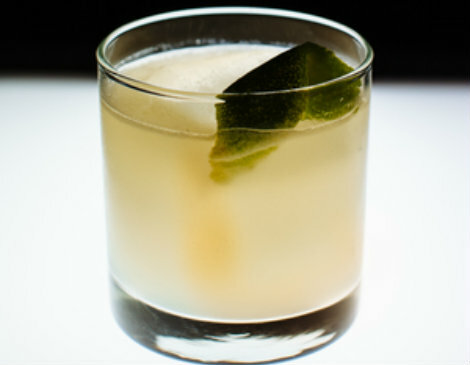 The Griffos released their first product—Scott’s Street Gin—to wide acclaim in 2015. Today they’re growing their business to include national distribution, a tasting room, and more spirits crafted in Betty, their 250-gallon, custom-made copper still. Stanford and Cal grads and world travelers, Mike and Jenny have the credentials and the network to live anywhere in the world. They chose Petaluma over other West Coast cities and even ultra-hip Brooklyn, New York—where the couple had lived for three years—for reasons both personal and practical. On the personal side: Mike and Jenny have children to raise as well as a business to build. Petaluma offers good schools, safe streets, a community atmosphere—and helping hands in the form of Mike’s parents and brother, who relocated to Petaluma from Southern California several years ago. On the practical side: Mike and Jenny offer upscale products that serve a niche market and by law can only sold only through distributors or, as of January 1, 2016, out of a tasting room. Petaluma meets their needs because it’s artisanal heaven. Moving to Petaluma was one of the best decisions we made in starting our business. Petaluma is a magnet for residents and visitors who appreciate and can afford to pay for the finer things in life and it’s home to a number of distributors that focus on high-end alcoholic beverages. That means Mike and Jenny can build their brand through events and marketing, while ensuring that their products can be found on retail shelves along the West Coast. Plus, despite being 50 miles from downtown San Francisco, the Petaluma area remains a productive agricultural region. So Mike can source ingredients within 15 miles of the distillery—making Griffo products hyper-local as well as ultra-delicious. From the outset, the Griffos knew they’d have their family’s help. What they hadn’t expected was the outpouring of support they received from other local businesses. For example, Santa Rosa-based Redwood Credit Union offered the Griffos secure a small business loan to jump-start the business. And other artisanal beverage makers—like Sonoma Port Works—offered introductions that helped the Griffos establish themselves locally. Mike believes the City of Petaluma does a good job meeting the needs of the business community while preserving what makes Petaluma unique. For example, during an initial visit to the City’s Planning Counter, Mike learned about the City’s Development Review Committee (DRC), which meets each Thursday to review new construction and renovation proposals. Mike got on the DRC’s calendar right away, and the feedback he received was crucial to helping understand City requirements and timelines. The Economic Development Division has also been helpful, answering questions about setting up a new tasting room and connecting the Griffos to other businesses in town. The City Manager requested a tour of the facility and Mike was more than happy to accommodate him.